This time on Go Forth And Game I am very pleased to have my good friend, Micah Harris with me today. Micah and I met back in college, around 1982, I believe. In Science Fiction class. We found that we had common interests like Dr. Who and stop motion animation. Micah reintroduced me to comics and the comic book store. Throughout college we collaborated on a couple of comic strips, Discoman, Orpheus (volumes 1 & 2), and El Espectro, for The East Carolinian – the college paper. We also worked on some comic book ideas that never saw publication. That Moon Knight story is still a favorite of mine. Micah has continued as a writer publishing comics, graphic novels, stories, and articles. His most recent work is “Lorna, Relic Wrangler” published by Image Comics. Tom: Micah, welcome to Go Forth And Game, so what got you into comics? What is your geek cred? Micah: My geek cred? It’s the accumulation of over forty years of intense effort. One of my earliest memories can be dated to the age of four b/c that’s the publication date inside Creepy no. 5. I couldn’t even read but it made such an indelible impression on me that I recall the country store it came from. My brother who is eleven years older than I got a horror comic magazine so I had to have one. 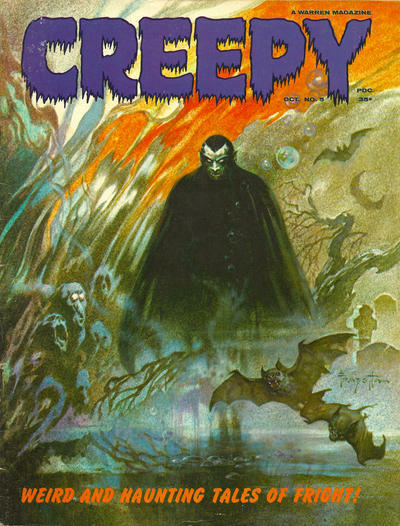 This issue has a sinister Frazetta vampire brooding over the cover. The Reed Crandell/Archie Goodwin adaptation of Bram Stoker’s “The Judge’s House” shook me up so much that I purged our mobile home of both my magazine and my brothers! I finally got to pay homage to “The Judge’s House” and Creepy in my story “Slouching Toward Camulodunum” (pt. one) in the latest Tales of the Shadowmen anthology (“Femmes Fatales”) published by Black Coat Press. Tom: How about giving us a rundown of your work? Micah: I got my big break at the tender age of 42 when Image Comics published my graphic novel with Michael Gaydos, “Heaven’s War.” We began collaborating on your “Discoman” and then our “Orpheus” strip for The East Carolinian back in the mid-80s, so I had been honing my craft and sticking with it for about fifteen years with little encouragement. The Watchnuts gag panel with Jeff Parker and then my and Jeff’s adaptation of Wilde’s “The Happy Prince” for Nathan Massengill’s “Poets Prosper” anthology were my only hits during that time. Who Watches The Watchnuts by Micah & Jeff Parker, with a bit of help from me. Adventures of Becky Sharp” which, like the “Shadowmen” stuff, is a ‘League of Extraordinary Gentlemen” proposition. And Ron Fortier’s Airship 27 published my novella last year “On the Periphery of Legend” in the second volume of “Jim Anthony, Super Detective.” It’s my homage to the original King Kong and scathing critique of the Peter Jackson remake. All of these are on Amazon by the way, as well as through the publishers’ websites. Tom: I really enjoyed ‘Heaven’s War’. It is seeped in history and lore of the period. I appreciated the work you put into it. Becky is fun. I need to read the Shadowmen and the Super Detective stuff. “Lorna: Relic Wrangler” is your latest endeavor. Where did the idea of a Southern ‘belle’ who battles the forces of evil originate? Micah: The idea for Lorna goes back to a novel I started writing in the mid-90s where she was the girlfriend of the main character. Then she started taking center stage in a couple of other books I wrote learning to be a novelist. In the last one, she started breaking into temples and holy places, swiping relics. You never saw that, but the characters talked about it. And, in the Lorna-prose universe, there was a millionaire named Vernon who had a stigmatic daughter and who you found out at the end was Lorna’s secret husband! Keep in mind, that’s an alternate universe to the comic book Lorna, but how much is the same and how much is different will only be revealed if Lorna’s comics career is able to continue. My friend Arthur Congleton who was one of Lorna’s first fans suggested I make the transition to comics with the character. It seemed to me the action adventuress facet of the character was best suited for the medium. The reason she’s set in rural North Carolina, specifically Washington N.C. (a.k.a. Tar Forks), is that I like the quirky small town milieu that you saw in Twin Peaks where the bizarre and other worldly casually collide with day to day life. That’s where two of the novels were set there, and Vernon and his daughter were already there. As for where the story is going . . . there’s an end in mind and it’s leading somewhere. Future stories would be contained adventures but the back story would be filled in bit by bit along the way, and then it would come to the front at the end of the mini-series. There are already seeds planted in the Image comics that’s out now: of course, you see Verne now has the capstone of the Washington monument in his possession and he has a use for it in Tar Forks. Let’s say it’s fated for a purpose the founding fathers wouldn’t approve. But if you look closely, there are some dots to connect for the sharp eyed. In the last story, “Doo-Buddy,” mention is made of a poltergeist named Lucifer Vesuvius haunting Lorna’s mobile home. If you look at the fullest version of Verne’s name in the short story with April, Verne’s daughter, it’s “L. Vernon Demurge.” So, there’s Lucifer Vesuvius’s initials an also, if you go Roman-school, the initial L and the V make “LU”. So, there’s a connection there that I’m not going to say what it is, but it goes way back to the early days of Tar Forks. Tom: The artist on Lorna is Loston Wallace. I love his art. How did I find Loston? Micah: I owe meeting Loston, at least partially, to some middle aged lady alleging Issac Asimov once thought she was a hottie (presumably when she was much younger and he was alive), and her deciding Mark Schultz needed to know this story. He was a guest at Durham’s Trini-Con back in 2003. I’ve been fortunate to be friends with Mark since ’89, but I rarely get to see him and hang out. So every moment is precious. And this gal won’t stop talking. The only anecdote I remember is her alleged brush with greatness. That’s what she’s claiming, and, of course, Issac isn’t there to give his point of view, so maybe she’s just tilting at the windmills of her mind. After all, can anybody there prove it didn’t happen? (Yep, Ed Wood/Criswell logic ruled the day, that’s how screwy the scene was). And Mark, the consummate professional, grins politely as he is regaled by her with this story. Loston also knows Mark, and he also is having to wait patiently. He brought a piece of art he’d done as a commission, and I commented on the authenticity of the Victorian Lady’s boots he’d drawn. And neither of us could have foreseen that it was the beginning of a beautiful friendship and a dream of a collaborative relationship. He’s one of those friends you just fall in step with very quickly and it’s like you’ve always known them. And he’s one of those artists that someone with my aesthetic sense dreams of working with, because not only does he have the same aesthetic, he can actually draw like that! Tom: Lorna is a very fun read. As a Southern gentleman, I like the in-jokes and references to places and practices with which I grew up. Ok, if you had your pick of projects, what would it be? Micah: My dream project — actually there are several I’ve talked with Loston about. I want to do a horror anthology comic book (see, now we’re coming back to Creepy in 1964) and I have a novel idea we’d plot together, I’d write it and he’d do these beautiful illustrations, black and white Joseph Clement Cole illustrations and then painted plates like Dean Cornwell or Lydecker or Wyeth. And there’s the big pulp project we’ve been working on off and on since 2004 and I’m really trying to make that happen right now. Neither of us is getting younger and I just turned 50. As far as existing properties . . . boy, there’re so many. I have a Hulk-Dr. Doom thing Loston and I have talked about. I’d love to do that: when I started seriously collecting comics for the first time when I was ten, the book to have was The Hulk and he was pitted against Dr. Doom in the first couple of issues I bought. I have a take on “Dark Shadows” I’d like a chance to do. I’d love to play in the Edgar Rice Burroughs universe. I’d like to do something with Marvel’s “The Defenders” because that was a big favorite of mine in its early issues by Steve Englehart and Sal Buscema. Had a major crush on the Valkyrie –hot-cha! And there’s a Star Wars novel or comic I’d love to write with some of the bad guys as the central characters — but not so much Darth Vader, and no Fett. Also, as a kid, I was a major Man-Thing fan. I’ve just hit on an idea for Man-Thing that would be a fresh take but at the same time bring him back to his, uhm, roots. Tom: I think you would be excellent for a horror anthology. I think ‘The Defenders’ would be a good property for you too. And the ERB and Star Wars ideas sound pretty cool. I know you have an interest in the occult and things weird. Your knowledge in this area is pretty impressive as witnessed by Heaven’s War in particular. It is an excellent mix of horror, history, occult, and Christian ideas. How did you develop this knowledge? Micah: My interest in the occult developed I guess because if you’re a kid into horror and fantasy, you get a taste for this sort of thing: monsters, and demons, and the Van Helsing types pitted against him. When you’re a bookish ten year old, and Van Helsing is embodied in Peter Cushing – bookish but also a bit of swasbuckling athletics in there as need be, and the one guy who knows what’s going on – he becomes your hero. My appreciation for Cushing’s Van Helsing has grown as I’ve become an adult. 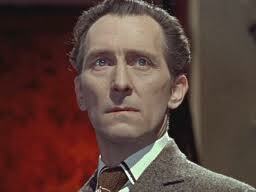 My friend Rod Bennett pointed out the “purity” Cushing has as Van Helsing. “Purity” is usually seen as vulnerable, weak, and naïve, but that doesn’t describe Van Helsing: purity is adamantine in him and the guy has seen what evil can do, so out goes naiveté. He’s totally uncompromising and doesn’t mess around when it comes to getting the job done. Watch his seriousness as he stakes the mother vampirised by her own son in “Brides of Dracula.” Nobody conveys the serious business of a hammer going down on a stake than Cushing under Terrance Dicks’ direction. It’s like spiritual amputation without anaesthesia needed to save a soul. And I believe in God and the devil and the supernatural world and that there’s a hidden, on-going war behind everyday life that sometimes tangibly intersects with everyday life. Tom: You hit it right on the head for me. Growing up watching Harryhausen movies, the Universal monsters, and the films from Hammer had such a big influence on me. Cushing’s Van Helsing is quintessential. Speaking of heroes, who is your ‘hero’? Micah: Whose work do I admire? I’m a lot more critical about his work in more recent years, but Alan Moore. I look forward to The League of Extraordinary Gentlemen whenever it comes out, and I’m excited about his long prose novel ‘Jerusalem’ that he’s been working on. From Hell to me is an incredible work, my favorite graphic novel. I know if I went back and re-read it, I’d get so much more out of it than the first time because I’ve grown enough in the intervening years to get where Moore was back in the early ‘90s. We’d differ on a lot of things, but he’s still one of my literary heroes and — here’s something I’ve bet no one’s ever said to him about Watchmen — reading Watchman got me through D.H. Lawrence’s “Women in Love.” Thanks Alan! You taught me about literature. 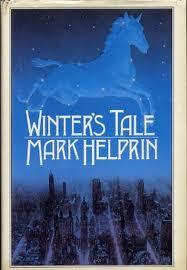 I’m also a big admirer of Mark Helprin and his novel “Winter’s Tale.” I wrote my master’s thesis on it. I learned so much from it and just thinking about it almost makes me tear up, like the poignancy of classical music it can heighten your sense of existence. C.S. Lewis is probably the most influential writer in my life in a personal way, but Ray Bradbury is, in terms of a literary aesthetic, the most important writer in my development. He was the perfect transition writer from ‘juvenile’ to ‘adult’ reader. It was “Dandelion Wine” which I read in the 9th grade, that brought the music of language to me. I didn’t understand the craft behind it at 15, but that made it all the more effective. Tom: I love ‘Winter’s Tale’. It is one of the best books I have ever read. Thank you for introducing it to me. And Bradbury is one of my favorites. You are a voracious reader as I remember what are you currently reading? Micah: Right now I’m reading “Drood” by Dan Simmons. It’s incredible! Tom: What’s coming up from Micah Harris? Micah: As for future projects, I’m still trying to polish up my big, literary novel that I’ve been working on, off and on, for nearly six years. I’ve got the go-ahead to write an article for a film journal on one of the great, never made movies in the post- Star Wars boom. I’ve already interviewed the director and some effects people who would have been involved. I’m also slated to do a couple more novels for Ron Fortier, including “Ravenwood,” an old pulp occult investigator who has the whole ‘Dr. Strange’ – ‘Ancient One’ thing going about thirty years before Marvel comics. It’ll be about one of the great unsolved mysteries of Hollywood. I pitched a Dracula idea to Ron and he liked it, so that looks like a go. In comics, Loston and I have already got enough material in story ideas to fill a trade paperback of “Lorna, Relic Wrangler.” It’s just a question of economics. Unfortunately, because it says ‘one-shot,’ some folks may have gotten the idea that the one book is all that was intended. Nothing could be further than the truth. The one-shot was always intended to test the waters and introduce our cast. Like I said, enough stories are already conceived that could fill a trade easily. “Lorna” fans include some sharp, intelligent folks. Cute, good girl art is the order of the day, but that’s only one level. 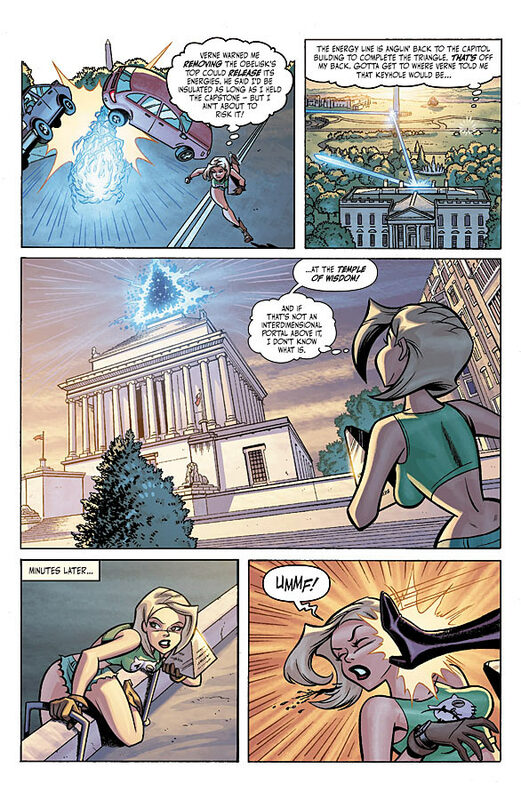 For example, Loston drew Lorna’s stretch in panel one, page one to mimic the shape of a Masonic compass. So, its cheesecake, but it’s not exactly gratuitous because it establishes the theme and motif. Also, practically every Washington D.C. background in the story is real. Loston was keen that the story be rooted in reality. It’s a very Carl Barks thing, putting these cartoony characters in researched real settings. One panel, an aerial view of a pentagram forming over D.C., took him seven and a half hours to draw. He didn’t photoshop it. That was a day’s work. One panel. Seven and a half hours. And no Daisy Duke shorts in sight. So, any of the critics who have been blind to these values but have made their disdaining pronouncements of how this is some kind of sexist T and A book, have really just demonstrated how vapid are their own perceptions – which does not become you if you’re calling yourself a critic. But let me be quick to add there are critics who enjoyed Lorna and were simpatico to the character and responded to her warmth and charm. And Dan Cole at Broken Frontier (http://www.brokenfrontier.com/reviews/p/detail/lorna-relic-wrangler) was a perceptive critic who quickly got beneath the surface of things with Lorna and had a real appreciation. Be sure and scroll down to read the letter from the Englishman I ticked off for insulting his country. I didn’t exactly make American Southern men look good either, and I’m one of ‘em. I’m an Anglophile, too. Those parts of the story were just a lark! (And now I’d like to apologize ahead of time to all the larks out there for implying they are nothing more than teases. The lark (FAMILY: ALAUDIDAE) is, after all, a respected and valued member of our environmental ecology and I intended no disrespect). There are readers who’ve told us the story MUST go on, they’ve got to find out more about these characters. As I said, it’s a question of economics. All you Lorna fans, talk her up on the Image board, plug her on your blogs and websites — or when you’re just hanging out at your local comics store. Spread the word and get everyone who will to have their comic shop re-order. Tom: I am looking forward to reading your novel. I am also very interested in that film journal article about the never made movie . Please let me know when it comes out. Are there any ‘recollections’ of a certain Marvel writer that you would like to share? Micah: My past collaborations with Jeff Parker? Do you mean when we discovered bread mold had medicinal purposes or unveiled the DNA double helix? Oh — the East Carolina University paper comics page? Tom, you were there! I just came across some old photos you took, you young whippersnapper — well, we all were in those photos — of you and me and Jeff doing comics work at our table in the student center (actually, I’m pretending to proof something). It was a blast under Jeff’s regime as comics page editor since everything was comic book friendly. When we met, he was doing “Undercover Cats” and I remember how excited I was to see his original art for this Batman parody he’d done at the paper offices. I hadn’t met him yet, but he liked my articles and we discovered we were members in the same mutual admiration society. So we finally met and started collaborating on a funny-animal story (back in the 80s, there was an adult market for such things). Good times — sleeping on his floor at his apartment . . . plotting out stories. Then he’d drive over to my mom’s where I was living, and we’d put “Plan Nine from Outer Space” on while he drew. I don’t know if you knew Jeff’s late mom was singled out from her fiction writing class by the great Manly Wade Wellman as being the one with real talent. That’s quite an honor, and her promise has been allowed to be fully realized in Jeff. He was always a natural storyteller and he was a good pal to grow up with creatively. Tom: I remember those days fondly. Going to Bojangle’s at midnight with the crew from The East Carolinian for ‘brain food’ was always fun. I remember Jeff ghosting my Orpheus so I could make deadlines. That was a lot of fun. Thanks for the interview Micah. It was fun catching up and remembering the ‘good ole days’ at ECU. Lorna is a fun story and I can’t wait to read more. So all you Lorna fans, buy multiple copies of the book and write Image so we can have more adventures. Readers, keep checking back here at Go Forth And Game for future announcements from Micah and Lorna.